More and more people are using eCommerce solutions such as Shopify and Big Commerce to help them start selling online. These can be great services to test the water with, or even build a full eCommerce solution on. However, just because the service is built and maintained for you, this does not mean that you can ignore the basics of SEO on your website. One of these basics is what do when you delete a product from your store. When you delete a product you create a situation known as a 404 error or file not found. While this is annoying to customers, it can be harmful to your site when it comes to the search engines. Especially if you create a lot of 404s by constantly deleting product without redirecting the URL properly. the issue is one called crawl budget. The search engines decide how many pages of your website to crawl every day, your crawl budget. If you have a significant number of missing pages, these will cause the pages that are there to be seen less often since each missing page that the search engine tries to reach counts towards your crawl budget. Fortunately, Shopify has made this relatively easy to deal with. As long as you follow the proper steps. 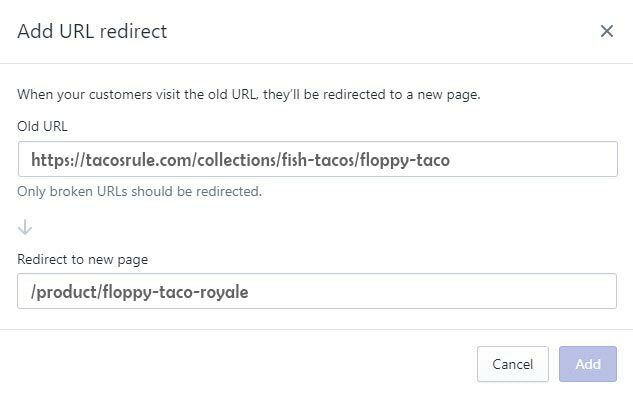 If you replace the floppy taco with the floppy taco royale you now have 5 URLs to redirect to https://tacosrule.com/product/floppy-taco-royale help save your crawl budget even though the search engine knew that you had a canonical URL specified. First, we need to go to the redirect tool. You can find it by clicking on “Online Store” then “Navigation” and then URL Redirects under the Navigation Title. You should now be on the Shopify Redirect page. From here you can create new redirects and see redirects that you have created in the past. To add your new URL click the Add URL redirect button and fill out the popup. 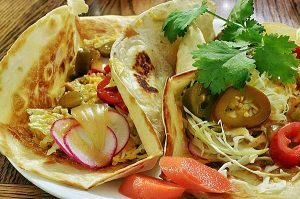 In the top line, you add your old URL: https://tacosrule.com/collections/fish-tacos/floppy-taco. In the bottom line, you add the new URL: /product/floppy-taco-royale. The new URL must be the new canonical URL and does not need to include your domain name. Click “Add” and your new URL redirect is complete. Repeat this process for every URL that needs to be redirected. 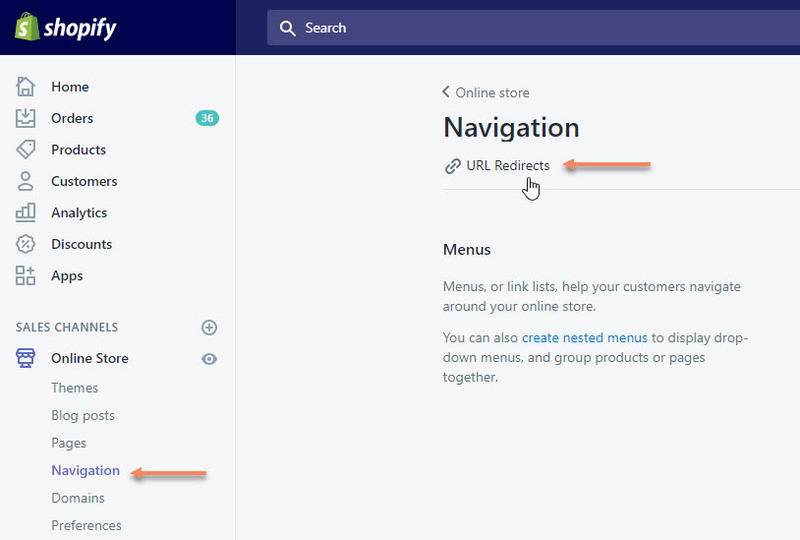 Once you are done, test your store to make sure that the redirects you just added go where they are supposed to go. 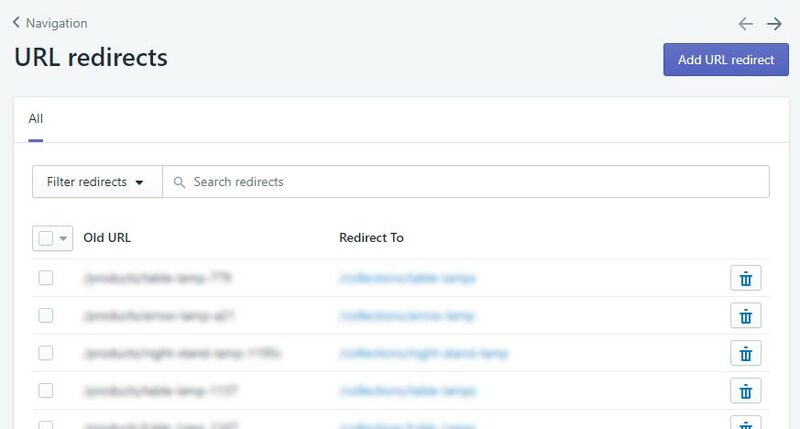 While we are discussing adding redirects, I recommend that you follow this simple process for determining where to redirect to. If you cannot use the first redirect, move to the second, if the second is not available, the third and so on. Finally, you can see what pages Google thinks are missing by logging into your Google Search Console page and look under Crawl and then Crawl Errors. There you will see every missing page and the pages that link to it so that you can correct those links as well. Keeping up with your 404 pages may seem like a minor thing to do, but if you allow it to get too far out of control you do run a chance of having them affect your crawl budget, and by extension, the number of pages that the search engines may index from your site. That, and they are boring to fix when you have hundreds of them to do, so make it a monthly task so that you need only do a few at a time.